On the Display Network, it is possible to use CPM (Cost Per Thousand Impressions) instead of CPC (Cost Per Click) bidding; specifically, this is used when executing branding campaigns rather than direct response campaigns. Consequently, this metric is not commonly used as businesses aim for more tangible results than ‘people who potentially saw an advert’. When you are trying to maximise impressions to drive brand awareness or create early touch points in the conversion funnel using CPM bidding is the ideal way to execute that strategy. CPM bidding is unique in many respects to other types of bidding. Even CPA or ROI eventually have to bid at a CPC level to achieve target CPA or ROI... Google will not bill you on a CPA basis. Thus, CPM bidding is unique in that respect (with the exception of YouTube advertising which charges for views), as there are not many ways to pay for AdWords outside of ‘pay per click’. An Avg. 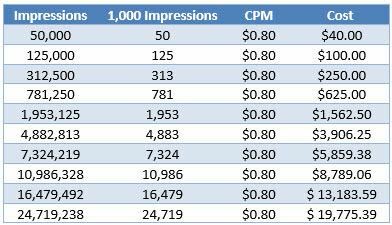 CPM column can be added to most reports and even if you are not using the CPM bidding strategy, you will still see monetary values in the column. This is because the CPM is simply a calculated metric, in the same way you can see the effective CPC in campaigns using CPM bidding. Clearly these metrics provide little value when they are not relevant to the bidding strategy.